Bernard Lee, Barry Foster, Michael Gough, Hazel Court, Alfred Burke and Paul Daneman star in The Edgar Wallace Mysteries, Volumes 3 & 4. 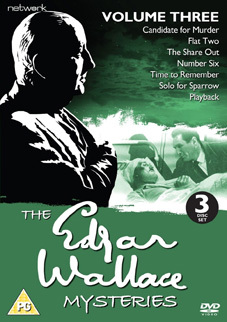 Based on one of the twentieth century's most successful crime novelists, Edgar Wallace's thrillers have been widely adapted for film and television – the most memorable of which is this series, made at Merton Park Studios during the first half of the 1960s. With a noir-esque feel, The Edgar Wallace Mysteries updates some of the legendary writer's stories to more contemporary settings, blending classic B-movie elements with a distinctly British feel. Unseen for decades and freshly transferred from the original film elements specifically for this release, all 47 films will be released over seven volumes courtesy of Network DVD. Scripts are by both Philip Mackie (The Naked Civil Servant) and Robert Banks Stewart (The Human Jungle) and each volume benefits from a written introduction from Kim Newman. 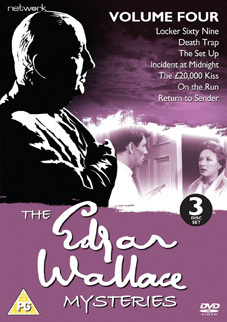 The Edgar Wallace Mysteries, Volumes 3 & 4 will be released on UK DVD on 17th September 2012 by Network DVD at the RRP of £29.99 each.